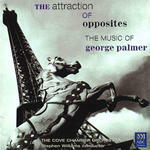 The attraction of opposites / the music of George Palmer. The Ruritanian dances / George Palmer. The Ruritanian dances : for orchestra / by George Palmer. Contents note: Dance 1 (3 min, 9 sec.) -- Dance 2 (2 min, 14 sec.) -- Dance 3 (4 min, 41 sec.). 9 May 2012: at Canberra Symphony (Llewellyn Hall ANU School of Music). Featuring Canberra Symphony Orchestra, Andrew Mogrelia.